Monday night I decided to watch Urban Legend and Urban Legends: The Final Cut, and while I always love the first film because it is entertaining, kinda creepy, and so much fun. The second film loses a lot of what the first film I had. To make the plot simple without spoiling anything, Urban Legends: The Final Cut surrounds a group of college filmmakers set out to make a horror film for a college project led by lead actress (Jennifer Morrison). But once the camera starts rolling the crew of students start getting killed, and Morrison’s character tries to stay alive before the final cut! Who will survive to see the movie in the end? After watching Urban Legend, I thought I would give Part 2 a watch to see if I liked it still. But after watching how fun the first film is, the second film is a letdown and misses a lot of what the first film has. While the first film is entertaining and a fun ride, this film is just weak and boring after the first 30 minutes. The movie starts off good,but slowly turns for the worse because the pace is slow, most of characters are weak besides a few, the kills are nothing special, and even though the killers reveal is pretty shocking the first time you see the film it still doesn’t shock you as much as when the killer is revealed in the first film. The only goods things that make this film worthy to watch are some of the characters, one kill involving a bathtub and ice, the killer’s outfit, the first 30 minutes, and the last scene involving a familiar face from the first film. Urban Legends: The Final Cut is one of the weakest “college” slashers next to Sorority House Massacre 2, and Blood Sisters. 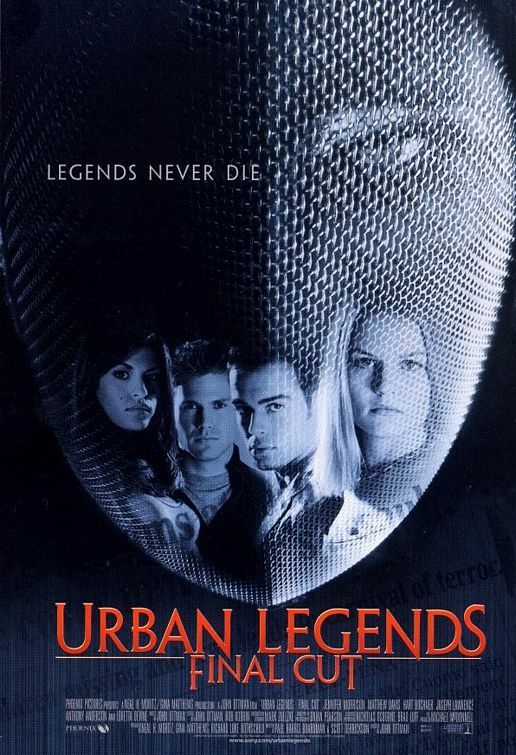 Urban Legends: The Final Cut is not the worst film,but not the best either. It’s one you can watch once in a while or possibly after watching Part 1 as a double feature. Part 2 however is better than Urban Legend: Blood Mary, which has no reason to be apart of this series.